We print greeting cards in two sizes: 8” x 6” sheets that fold to 4” x 6” cards and 10” x 7” sheets that fold to 5” x 7” cards. Each sheet can print in color on both sides and is scored for easy folding and insertion in appropriate sized envelopes, which we include with your order. Greeting cards are printed on 12pt card-stock (or 100 lb. gloss cover paper) and come with your choice of a glossy UV coating or a dull finish. We provide a well-stocked template gallery that allows you to choose from card designs created for many popular occasions, including holidays, birthdays, weddings, graduation, and other events. You can pick the design you like and easily customize it online by typing in information such as holiday greetings or a personal message. 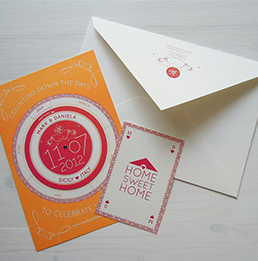 It’s a convenient way to create all your special occasion greeting cards.